Plochmann Lane: Billy Bob Thornton & The Boxmasters signed / framed album. 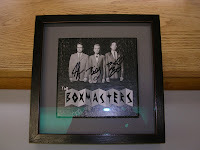 Billy Bob Thornton & The Boxmasters signed / framed album. We had this autographed album recently framed. We attended Levon Helm's Aug 23rd Midnight Ramble & Billy Bob Thornton & The Boxmasters were one of two opening acts & we acquired the signed album then.